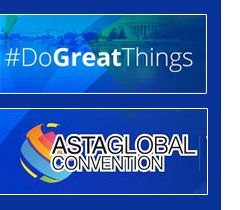 Omega World Travel and its brands, Cruise.com and TravTech, will exhibit at this year’s ASTA Global Convention. This event brings travel agencies and their employees an education on every role in the industry, with advocacy training, legal refreshers, human resource management, specialized sales tactics, and more. Over one thousand attendees will have the opportunity to explore the trade show and sit in on dozens of educational sessions. Omega’s President and CEO, Gloria Bohan, will emcee a session entitled “The Entrepreneurial Spirit – Do Great Things.” In this “Shark Tank” style contest, finialists pitch their innovations to a panel of judges to compete for the 2018 Entrepreneur of the Year Award, sponsored by the Dan and Gloria Bohan Foundation. This year’s judges include Marc Casto, President & CEO of Casto Travel; David Chait, Founder & CEO of Travefy and winner of the 2017 ASTA Entrepreneur of the Year Award; Denise Jackson, President & CEO of Balboa Travel Management; and the audience. Stop by Omega’s suite, the Dupont room, to learn about all aspects of the full-service travel management company and enter for a chance to win airline tickets, a cruise for two, or an Amazon Echo!